Letter from Department of National Defence, to Libero Sauro, January 7, 1941. Rev. Libero Sauro was arrested on September 7, 1940 and held at Don Jail before being transferred to Petawawa Internment Camp. Internees were allowed to receive parcels from family members. These packages were searched thoroughly by camp guards before being distributed. Internees mostly received food and clothing. After his release, Sauro continued to help other Italian Canadian internees and their families. In a later postcard, he himself is thanked for a parcel he sent to a group of 38 internees for the Easter holidays (ICEA2010.0008.0004). 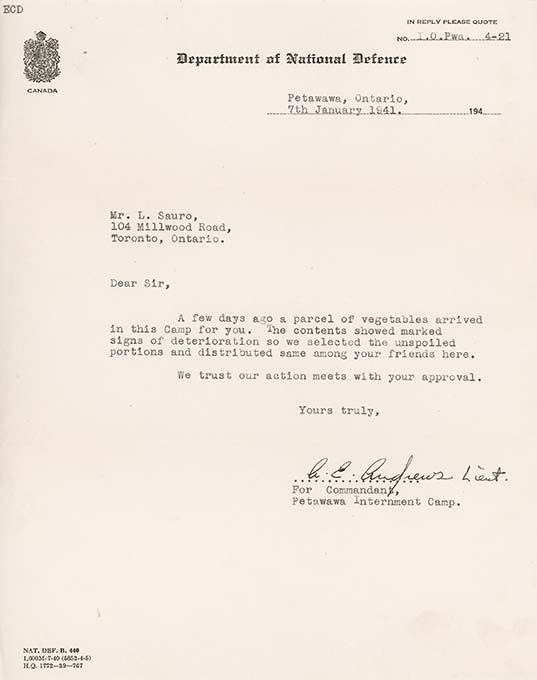 This document forms part of a collection of documents and other materials donated by the Sauro family.